Please Be Patient When Adding Tickets to the Cart. It may take some time to Process. THIS EVENT IS SOULED OUT! 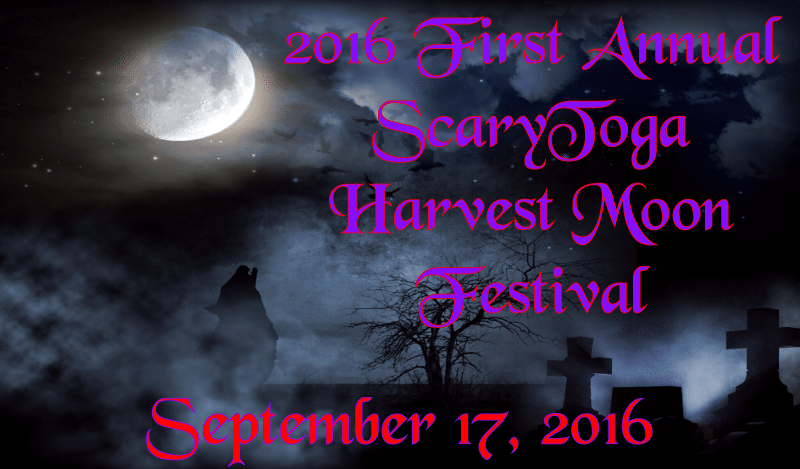 The 1st Annual ScaryToga Harvest Moon Festival will be held at the Saratoga Winery on September 17, 2016 and is for Adults 21+ Only. Tickets and Access Passes*† are available for purchase now! We will be offering music and variety of alcoholic and non-alcoholic beverages. There will also be food and snacks for your enjoyment. Along with refreshments, we will also have plenty of paranormal activity for you to engage in. Throughout the evening you can take part in real paranormal investigations, group and private psychic readings, carriage ghost tours, tiki-lit seances…and much more! Ticket holders will also be eligible for prizes and can check out our paranormal technology demonstrations. Additionally our vendors will be providing opportunities to purchase ScaryToga Fear Gear, souvenirs, ghost hunting equipment, and other paranormal related products and services. We would appreciate those with the FULL ACTIVITY PASS to PLEASE limit their participation in each of the FEATURE ACTIVITIES (1) Time to enable everyone to enjoy a full ParaPalooza Experience. All Vendors, Private Readings, Authors, Presenters, Spiritual Artists, the Bars, Food Services are Open. Social hour to meet, greet, interact with the Paranormal Teams, enjoy live entertainment and socialize. 7:15PM ALL Feature Group Activities Begin. 11:15pm-11:45pm Ray Feurstein- the Art of House cleansing and smudging. *The Access Pass provides access to various paid group activities within the festival. It DOES NOT include access to private readings or sessions and may not be applicable to all activities. To ensure that we can provide a GREAT experience for Activity Pass buyers we will be caping the total number of Passes sold. GET YOURS TODAY TO ENSURE YOU CAN PARTICIPATE FULLY! †Due to the nature of our offerings, and the possibility of vendors not showing, backing out, or cancelling, we may need to change what activities will be available in general, as well as what is included in the Access Pass.